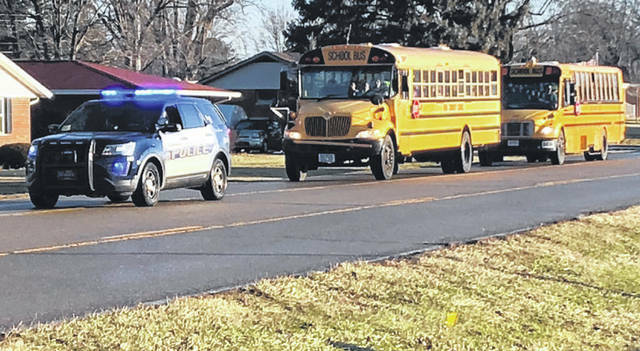 Scott Halasz | Greene County News A Xenia police car escorts school buses full of students from the high school to a nearby church Feb. 4. The school was locked down and eventually closed for the day because of a threat made by a student. XENIA — A Xenia teenager was charged with inducing panic Feb. 4 after allegedly threatening to come to Xenia High School with a gun. The male, who is not being named because he is a juvenile, allegedly made the threat on social media and a concerned parent alerted school officials according to police, who received the call around 7:05 a.m. The district was locked down while police searched for the suspect and classes were ultimately cancelled at the high school and at the elementary schools. High school students were bused to nearby Faith Community United Methodist Church. Drivers were taken back to the high school and released. Walkers and those driven to school by parents were picked up at the church, according to school officials. Warner Middle School remained open and district after-school activities went on as planned. “We immediately initiated our emergency management plan,” Superintendent Dr. Gabe Lofton said. “The student in question was not at the high school however, for safety precautions we moved forward with initiating appropriate safety measures. I am proud of our staff and community for reacting appropriately and swiftly to the situation to keep our students safe. The suspect was taken into custody in the Arrowhead subdivision without incident, according to police. Everything was calm inside the building, according to XHS junior Jordyn Thomas. The suspect is currently incarcerated at the Greene County Juvenile Detention. Wilson said it is a violation of law to just make a threat on social media. https://www.xeniagazette.com/wp-content/uploads/sites/32/2019/02/web1_High-School-Gun-Threat.jpgScott Halasz | Greene County News A Xenia police car escorts school buses full of students from the high school to a nearby church Feb. 4. The school was locked down and eventually closed for the day because of a threat made by a student.